You’ve likely heard about the health benefits of collagen. It helps improve skin elasticity, reduce joint pain, and can help heal a leaky gut (1, 2, 3). You’ve probably also seen collagen peptides listed as a key ingredient in beauty products for healthy hair and skin, promising lustrous locks and a reduction of fine lines and wrinkles. Collagen is, in fact, among the most abundant proteins in the human body, so it makes sense that products touting its benefits would pop up in health and beauty circles (1). While the effectiveness of collagen-rich topical products is yet unsubstantiated, there is definitive research supporting the overall health benefits of ingesting collagen-rich foods. And it turns out that it’s pretty easy to add collagen into your diet. Whether in the form of gelatin-rich bone broth or in a more processed form called collagen peptides, collagen can be a part of your healthy diet and lifestyle. Let’s first understand what collagen is and how it’s processed into collagen peptides, and then we’ll cover some ways to add more of it into your diet. Collagen is the most abundant type of protein in animals (including humans). It’s an essential component of nearly every cell in the body, especially connective tissue (tendons, joints, ligaments, skin) and muscle. It acts as a glue that holds us together, keeping not only the skeletal and muscular systems working properly, but also internal organs, including the digestive tract (4). The individual amino acids that make up collagen have been shown to reduce gut permeability and improve gut health when consumed over a period of time (2). As we age, we begin to naturally decrease our collagen production, which results in signs of aging. 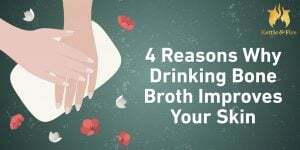 When bones are cooked in liquid over multiple hours, the bone matrix breaks down, releasing gelatin (partially processed collagen) into the cooking liquid, which you can then consume in the form of bone broth. The health and beauty benefits that bone broth claims are due in large part to the gelatin and collagen contents within. When bone broth is refrigerated, it firms up into a Jell-O-like substance, as does the powdered gelatin you’d buy to make Jell-O at home. Gelatin only remains a liquid consistency when it’s warmed. Collagen peptides are very short chains of amino acids, the building blocks of all of the muscle and connective tissue in the human body. We mentioned that gelatin is a processed form of collagen that turns thick and viscous when refrigerated. Collagen peptides are the result of an even finer processing (a hydrolyzing process), resulting in the most broken down form of collagen. It usually takes the form of a fine powder, either called collagen hydrolysate or hydrolyzed collagen peptides. This form of processed collagen is the main ingredient in collagen supplements and collagen protein powders that you’ll find at your health food store. Because of the additional processing, this form of collagen doesn’t require hot liquids, but can be added to cold liquids as well without gelling back up. For this reason, it’s typically blended into smoothies or mixed with water, nut milk, or juice for consumption. Does Processing Make a Difference? While it’s true that overly processed meats, oils, and fats aren’t always ideal for a healthy diet, not every process is created equal. For example, It’s a process to press the oil out of a coconut to make coconut oil. Coconut oil is a saturated fat and very stable, and most coconut oils are extracted using an expeller pressing process, which doesn’t overly heat the oil and damage it. In this case, the “process” results in a healthy and delicious high-heat cooking oil, not something scary or bad. Same goes with expeller-pressed or cold-pressed avocado oil. Where Do We Draw the Line When It Comes to Collagen? Most collagen-rich products need to be at least minimally processed in order for us to consume them with any regularity. For example, we humans don’t tend to enjoy chewing up raw bones, so to consume collagen from animal bones, we need use the slow, low heat cooking process of making bone broth. The cooking process not only makes consuming collagen more enjoyable, but more digestible as well. Dairy products, eggs, and fish are also rich in collagen, and we tend to process all of these items before consuming them as well, through pasteurization, culturing, and cooking. These processes provide the same result as making bone broth: the collagen is now more delicious and more digestible. The next phase of processing is where the questions begin. Dried and powdered gelatin is certainly more processed than bone broth. And the collagen hydrolysate, the stuff you can mix with cold liquids, is even more processed than that. There aren’t enough studies comparing the difference between minimally processed gelatin and highly processed collagen peptides to determine if the processing itself yields inferior results, but the research that’s available seems to point to promising findings for processed collagen in all three areas we outlined at the beginning: joint health, gut health, and skin elasticity (1, 2, 3). How Can You Get More Collagen Into Your Diet? We’ve already shared a few animal-based foods that contain naturally occurring collagen: eggs, fish, dairy, and animal bones, skins and proteins. If you’re a vegetarian or vegan, choosing foods that provide the essential amino acids required to promote collagen production is a great strategy. Those foods include cruciferous vegetables, legumes, nuts, and seeds, just to name a few. Eating all of these foods on a regular basis is a great place to start, but if you want to ensure that you’re really boosting your collagen intake, you might consider using the hydrolyzed collagen (rich in collagen peptides) or other forms of processed collagen as well. We’ve collected a few suggestions to help you get on your way to consuming more collagen every day. Collagen coffee: Stir one tablespoon of collagen hydrolysate into your morning coffee for a boost first thing in the morning. It’s virtually flavorless and might even add a little body to your beverage. If you stir continuously and pour your brew over the collagen powder, this works for cold brew as well! Collagen smoothie: Add one to two tablespoons of collagen into your smoothie instead of whey or soy protein for an added boost. Vital Proteins Collagen Powder and Great Lakes Gelatin are both brands with good reputations. Collagen baked goods: It’s actually possible to use the less processed gelatin powder as an egg replacement. Here’s a good list of instructions on how to do that and a delicious carrot cake example. it’s important to remind you that dietary supplements aren’t regulated by the Food and Drug Administration, which means that you can’t always be sure that you’re getting what you think you’re getting. This is not to say that every supplement on the market is cheating or offering inferior ingredients. But because the FDA doesn’t regulate them (as they do the food-based sources of collagen), you might need to do a bit of additional research to ensure that you’re purchasing from a good company with good best practices, both for their production, but also for the welfare of the animals they’re using to make their products. A high-quality collagen supplement comes from pastured or grass-fed cows. You might see “pasture-raised bovine hides” or “grass-fed bovine hide collagen peptides” on the label. You might also see additional third-party certifications that ensure that the collagen came from non-GMO sourcing. Collagen-rich foods and supplements can be a part of your healthy diet, improving overall health, reducing joint pain, and even lessening some signs of aging. There are a number of creative ways to add more collagen into your diet, especially in the form of collagen peptides, which mix easily with just about anything. Balance is key. Collagen is a form of protein, so it’s important to count it as part of your overall daily protein intake to avoid overdoing it. As we mentioned earlier, the amino acids we need to adequately produce our own collagen stores are present in many of the foods we eat (or should be eating) on a regular basis. So take the whole picture into consideration to determine how much collagen you should supplement, and make sure you’ve chosen a brand you can trust.